Ireland Lacrosse shall, first and foremost, work to develop the sport of lacrosse throughout the island of Ireland for both men and women and at all levels from youth to adult. Arising out of this development, Ireland Lacrosse shall also oversee, manage and support the Irish national teams – for men and women and at under-age and senior levels. In pursuit of this mission, Ireland Lacrosse works through Ireland Lacrosse North America, a subsidiary entity registered as a not-for-profit (501c3) organization in the USA, and with the Irish Lacrosse Foundation (also based in the USA), to raise awareness of our programmes, develop lacrosse in Ireland, and generate support for our national teams. Ireland Lacrosse is also registered with the Office of the Revenue Commissioners in Ireland as a Sporting Body with Tax Exemption under Section 235 of the Taxes Consolidation Act, 1997, registration number 2925. The Irish Lacrosse Foundation is a charitable foundation registered in the state of New York in the USA that provides ongoing support and advice to the members of Ireland Lacrosse and Ireland Lacrosse North America in pursuit of the shared mission as articulated above. The Irish Lacrosse Foundation was previously recognised as the National Governing Body by the European Lacrosse Federation and the Federation of International Lacrosse; however, there has been a smooth transfer of NGB responsibility to Ireland Lacrosse (based in Ireland), commencing in July 2010, and since that time the organisation based in Ireland has been recognised as the National Governing Body by the European Lacrosse Federation and the Federation of International Lacrosse, as well as all Ireland Lacrosse members. 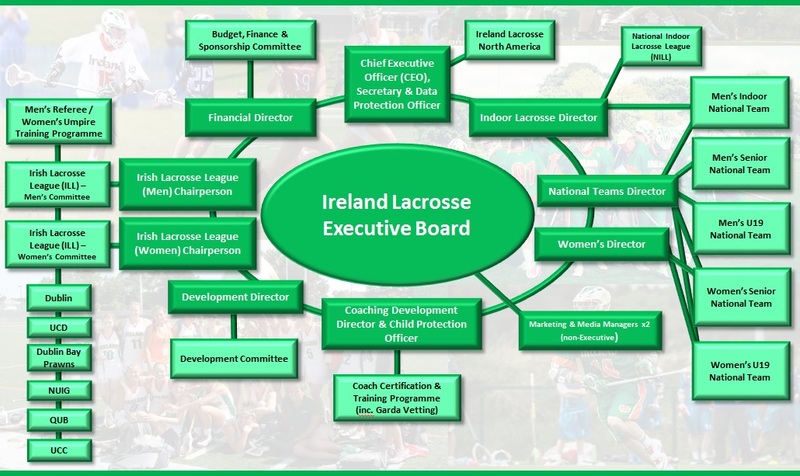 The Ireland Lacrosse Governance Manual contains detailed information about the governance and management of the organisation, its Constitution and Memorandum and Articles of Association, Executive Board Terms of Reference and Director Role Descriptions, and Strategic Plan information. The Ireland Lacrosse Book of Rules contains detailed information about the rules, regulations, policies, codes of conduct and guidelines regarding all activities of Ireland Lacrosse. In October 2017, Ireland Lacrosse was added to the ‘On the Journey’ Register of the Governance Code for Community, Voluntary and Charity Organisations in Ireland. The Ireland Lacrosse (Type B Organisation) Self-Assessment Checklist has been completed, and the Ireland Lacrosse Executive Board is aiming to approve its Public Statement of Compliance at its next meeting in October 2018, which will be published here in due course. Amendments to the Ireland Lacrosse Governance Manual or Ireland Lacrosse Book of Rules may be proposed via email to info@irelandlacrosse.ie, and should include the relevant section number and header. Proposals for amendments will be considered by the Ireland Lacrosse Executive Board and, where necessary or appropriate, by the Ireland Lacrosse general membership (normally via its Annual General Meeting (AGM)). Click here for the latest version of the Ireland Lacrosse 2018-2019 schedule. A new Budget, Finance and Sponsorship Committee (BF&SC) was agreed by the Ireland Lacrosse Executive Board at its meeting of 2 April 2018, and it was formally established at the Ireland Lacrosse Annual General Meeting (AGM) which took place on 13 April 2018 – the formal record of that decision is available in the minutes for the AGM published above. The Terms of Reference for the BF&SC are available in section 14 of the Ireland Lacrosse Governance Manual also published above.